The unique grave markers for Gyorgy and Juliet Kepes were designed by their grandson, Janos Stone, in 2003. Gyorgy was a painter and designer who founded the Center for Advanced Visual Studies at MIT, and Juliet was an illustrator for children’s books who had won the Caldecott medal. Their daughter, Julie, commissioned these markers to reflect their respective artistic sensibilities and heritage. Gyorgy’s marker is a traditional Hungarian Kopjafas monument, made of Tidal Water Cypress, a resilient wood. Each part of the structure is symbolically significant: the sloping top signifies a married man; the nine sections represent decades; and each semi-circle chip represents a year. 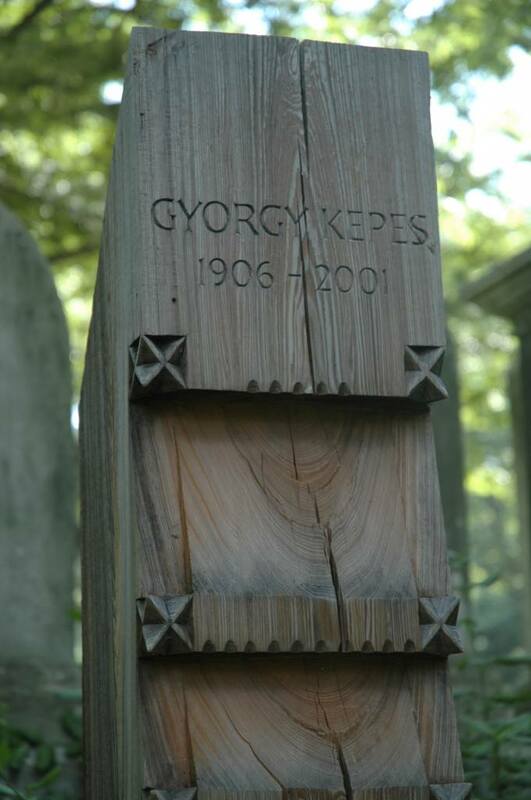 The carved designs on the corners represent Gyorgy’s village. All of these features inform the viewer of his age, marital status, and heritage. 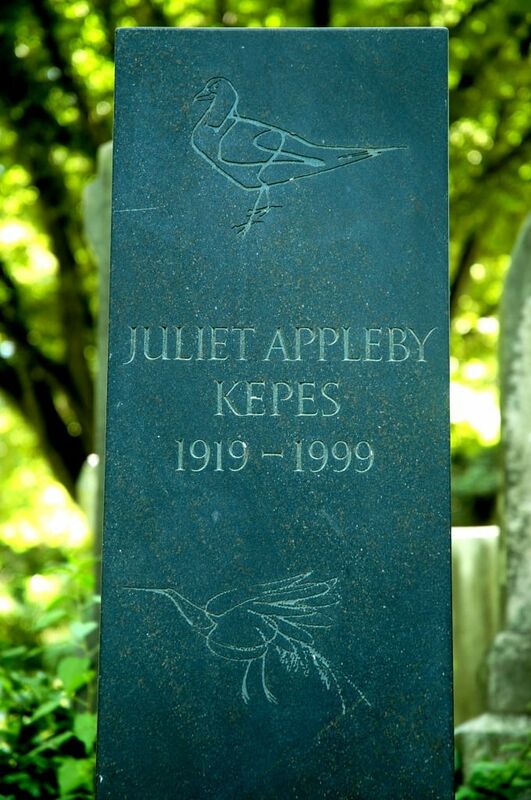 Juliet’s marker is made from English Bursting Stone, imported from her original birthplace in England. Stone scanned some of her drawings and transferred them into CAD format, where they were then carved into stone by machine. The result is a delicate, elegant aesthetic that resembles Juliet’s award-winning work. Oh, what a delight to read this, and to see how much I missed on Gyorgy’s cedar pillar. Thank you. Here’s my little diversion on the pair, surely amongst my very favorites in the Cemetery. Juliet’s drawings kill me.